Strong leadership is essential for survival in today's competitive business environment. Yet it has been estimated that from 25 to 75 percent of top executives hired today fail. Such failures can cripple the organization and adversely affect its stakeholders. So how can senior-level positions be filled with leaders who fit the bill? The Center for Creative Leadership has studied executive selection for years. Its researchers have interviewed hundreds of executives, analyzed the decision-making styles of the people who make selections, and studied the latest management and psychological literature on the subject. Executive Selection draws on this research, and on the extensive experience of the authors in working with top-level management, to offer a series of steps that decision makers can follow to make better hiring decisions. 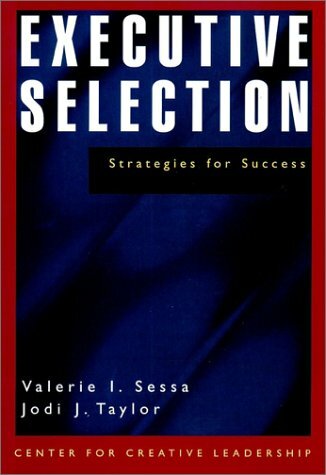 After detailing who should be on the selection team, the book shows how this group of people can develop a systematic way to look at the organization, its environment, the open position, and the candidate requirements. The team thereby develops an image of the ideal candidate that can be used throughout the selection process. Next, advice is given on the best way to develop a good candidate pool and how to gather and use the right information to determine who should be hired. Finally, Executive Selection makes recommendations that will help ensure the new executive's successful transition into the organization and his or her continued development. In all, these steps represent a comprehensive, easy-to-follow system that takes the mystery out of selecting for success. The book's strategies for pinpointing the right person for the job apply to the selection of CEOs, officers, and others in the executive suite. Executives, boards of directors, and HR professionals can use these strategies to improve their selection processes. Investors can use them to assess the executive selections being conducted within companies of interest. And researchers can use them to garner ideas for additional work in the field. VALERIE I. SESSA is a research scientist and director of the New Frontiers group at the Center for Creative Leadership. JODI J. TAYLOR is president of Summit Leadership Solutions in Colorado Springs, Colorado. Sessa, Valerie I.; Taylor, Jodi J.
Sessa, Valerie I., Taylor, Jodi J. 7. Executive Selection: Strategies for Success Sessa, Valerie I. and Taylor, Jodi J.